Sax Entertainment proudly presents The New Artist Concert Series featuring local, regional and national artists along with the introduction of new performing artists and bands. The series features music from various music styles including jazz styles of straight ahead, traditional, contemporary/smooth, Latin and jazz funk, as well as rock, blues, soul and classic R&B. Join Sax this Sunday, May 22nd with special guest, The Urban Jazz Coalition. The Urban Jazz Coalition is considered to be one of America’s hottest contemporary jazz groups to come onto the scene in some time and they’ve created a major buzz on the U.S. national festival circuit over the past few years. In the United States, Urban Jazz Coalition has received considerable radio airplay as their last four CD releases, “Contempo”, “Long Street”, “Down To Get Up”, and “A New Day” have all achieved “Top 50” status on national smooth jazz airplay charts. The band’s music has been featured on the NBC Reality Series, “Starting Over”, on the soundtrack of the hit French film, “Le Verite Ou Presque”, and another Urban Jazz Coalition album track has been licensed by Capitol/EMI Records as part of a Gospel/Jazz compilation project. With their unique blend of Urban Jazz/R&B, they have electrified audiences across North America performing at many of the nation’s top jazz festivals and concert venues including The Seabreeze Jazz Festival, Jazz Fest West, The Capital Jazz Fest, Russian River Jazz Fest, The Greater Hartford Festival of Jazz, The Smooth Jazz Summer Nights Concert Series at Penn’s Landing, Gahanna’s Creekside Blues & Jazz Festival located in the Columbus Metropolitan area and at numerous other venues around the country. The Urban Jazz Coalition sound is just downright energetic, jazzy and funky. 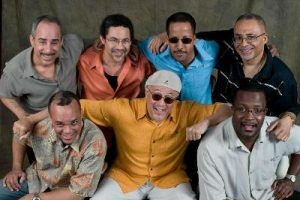 The group’s members consist of Phil Raney (Bass), Brandon Howard (Keys), Rich “Rico” Adams (Drums), Hector Maldonado (Percussion), Duane Tribune (Guitar) and Richard Randolph (Sax). Tickets for the concert are on sale now at the Bluestone Box Office, 583 E. Broad Street, Columbus, Ohio or can be purchased online via the Bluestone website at http://www.liveatthebluestone.com. Additional Concert Series dates and shows will be published soon.